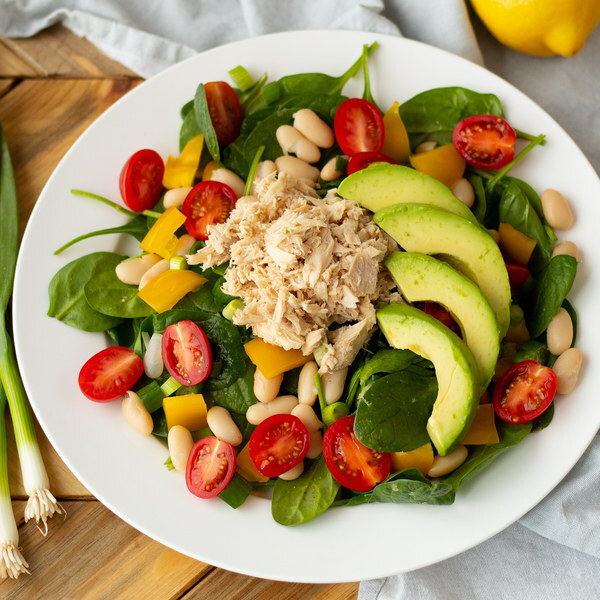 ← Lemony Tuna, White Bean & Sweet Pepper Spinach Salad. Grate the zest from the lemon and transfer to a small bowl, then juice the lemon into the same bowl. Peel and mince (or press) the garlic; add to bowl with the lemon. Add oil, salt, and pepper to the bowl with the lemon juice and whisk to combine the dressing. Drain and rinse the beans; set aside to drain further. Drain the tuna and transfer to a large salad bowl; flake with a fork. Place the spinach in the bowl with the tuna. Cut the bell pepper into quarters lengthwise; remove and discard the seeds and white membranes. Medium dice the pepper and add to the bowl with the spinach. Remove the root ends from the green onions and cut them crosswise, into ¼ inch pieces at an angle; add them to the salad bowl. Halve the tomatoes and add them to the salad bowl as well. Add beans to the salad bowl along with the dressing; toss to coat. Halve avocado and remove pit; scoop out the flesh and cut into slices; set aside. To serve, divide the salad between plates or bowls and top with avocado slices. Enjoy!